With spring’s first cherry blossoms starting to pop up around Richmond, people are priming their cameras for the city’s most scenic time of year. 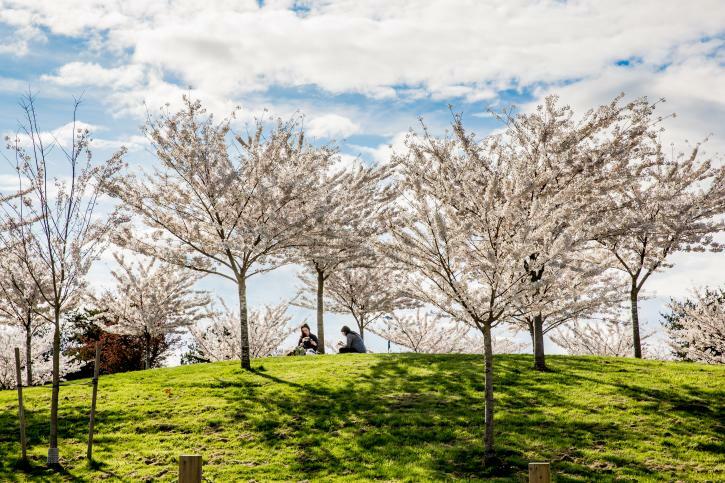 But as pockets of perfect pink burst forth in local gardens and green spaces, many will be waiting for the celebrated cherry trees at Steveston’s Garry Point Park to reach their splendid peak. Like a walkthrough snow globe, the park is where you’ll find one of the Lower Mainland’s most dramatic blossom displays. But while visitors roll in from far and wide to snap photos of the spectacle, others will be curious about the story behind the trees—and why Garry Point Park was chosen as their home. “The first group of 15 Akebono trees was planted in the park in 2000 by BC’s Wakayama Kenjin Kai society,” says Jim Kojima, describing an active group that works to keep alive the pioneering legacy of Richmond’s historic Japanese community. 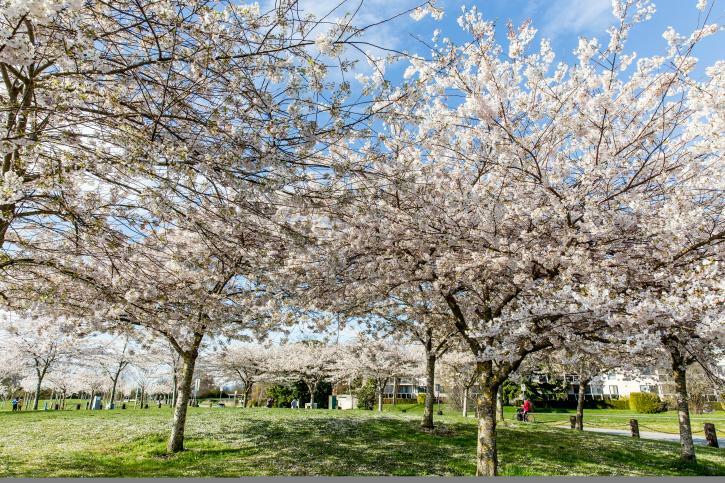 A long-time Richmondite of Japanese ancestry whose parents and grandparents worked in Steveston’s busy fishing sector, Kojima says the number of cherry trees at Garry Point Park is now at an eye-popping 255. “They were initially planted to mark the millennium as well as the 35th anniversary of the society,” he says. The society itself, he adds, is the clue to why they are situated in the park. Historically, around 75 per cent of Steveston’s Japanese fishing workers, a population that peaked in the first half of the last century, came from the fishing-forward Wakayama region of Japan. Many of them, says Kojima, initially lived near the latter-day park in the Scotch Pond area. These include fisherman Gihei Kuno, whose 1888 arrival from Wakayama was marked with a commemorative garden in the park a century later. “My grandparents also came from Wakayama,” says Kojima, adding that his grandfather arrived in 1915 and wed his wife as a ‘picture bride,’ a standard marriage-making practice where Japanese couples were paired before they’d even met. Like many fishing industry arrivals from Japan, the family thrived in Steveston; the men toiling on fishing boats and the women typically employed in gritty cannery work. Kojima was born just in time for World War Two—a tumultuous time for the local Japanese community. Canada’s wartime internment policy targeted those with Japanese ancestry and, in 1942, the then four-year-old and his family were forced to abandon their home and board a train to Alberta. “We spent seven years on a farm in Lethbridge before coming back to Steveston in 1951,” he recalls. Rebuilding their lives after losing everything was a huge challenge, but Kojima recalls teenage years working cannery shifts and fishing with his friends. And as he grew older, he plunged into community roles, becoming a board member at the Gulf of Georgia Cannery National Historic Site and helping to lead twin city initiatives between Richmond and the capital of Japan’s Wakayama region. “I was always thinking about what we should do in memory of those first and second-generation Japanese people who came here,” he explains. One of the key initiatives he supported was the Richmond Cherry Blossom Festival, launched in Garry Point Park in 2017 and gearing up for its 2019 edition on April 7. “Sakura [cherry blossoms] have always been very important in Wakayama; the people from that area love to gather and picnic under the trees,” he says. “Once the trees in Garry Point had grown, the next step was to create a festival. When people come to the event, they can think about the history but also simply enjoy nature and enjoy life together,” he says, adding that he hopes to see a cultural parade added to the festivities in future years.